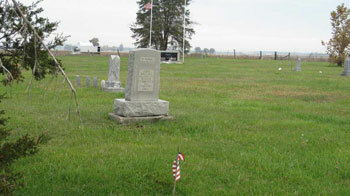 A more comprehensive list of burials in Weaver Cemetery may be found in the Marion Public Library's Genealogy Database. The Weaver Cemetery listing in the Marion Public Library database has been compiled from a variety of sources in addition to tombstone readings, including obituaries and death records. This is helpful to researchers since a number of people buried at Weaver had no stones. These photographs of the stones in Weaver Cemetery were taken by Dawne Slater-Putt 22 October 2009.